412th Test Wing Public Affairs, Edwards AFB, Calif. 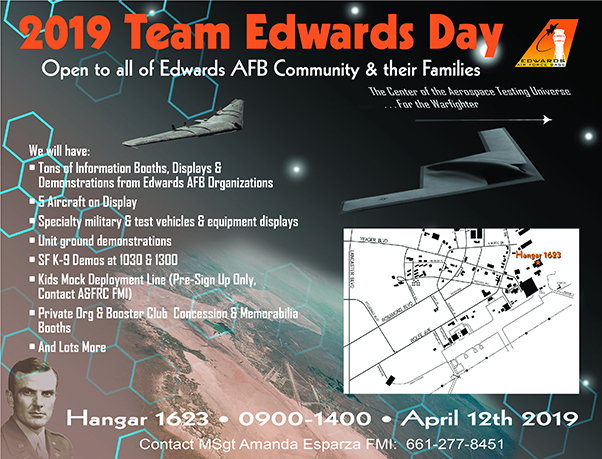 Team Edwards Day and Kids’ Mock Deployment Line is scheduled for April 12 at Hangar 1623, from 9 a.m. to 2 p.m. The event is open to Team Edwards members and their family. 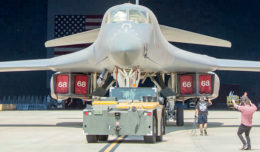 Aircraft, equipment and other military equipment will be on display, as well as Security Forces K-9 demonstrations. It’s a rare opportunity to see what Edwards AFB has to offer up close and personal. Enjoy informational booths, static displays, bouncy castles and more. Ground and K-9 demonstrations will be at 10:30 a.m. and 1 p.m. This event has been designated as an Alternate Duty Location by 412th Test Wing Commander, Brig. Gen. E. John Teichert, for all 412th TW Team Members. 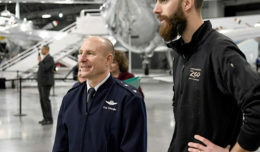 Federal civilian appropriated fund employees may be excused for a short duration, normally up to four hours to participate in the Team Edwards activities. The Team Edwards Day meets the criteria for excused absence as defined by AFI 36-815, Absence and Leave. Employees who wish to refrain from participation can remain at work or be granted appropriate leave. Please contact the Civilian Personnel Office at 661-277-3840 for questions. Civilian employees are encouraged to attend and bring their family members. The event will be a Branch Elementary School and Desert High School Excused Absences Day; parents who have students at these schools can take their children to this official school event and it will not count as an absence. Concession and memorabilia will be available for cash purchase from EAFB Private Organizations. For more information, contact Master Sgt. Amanda Esparza at 661-277-8451.